You’ll find so much to do in Puerto Galera. As well as Scuba Diving, El Galleon offers kayaking, sunset cruises, beach hopping, volleyball, golfing, snorkeling, and trekking. Whether it’s a lazy day in the sun, some adventure or a game of golf, we have what you’re looking for. Qualified scuba divers can enjoy over 40 dive sites and further their scuba certification to all levels. 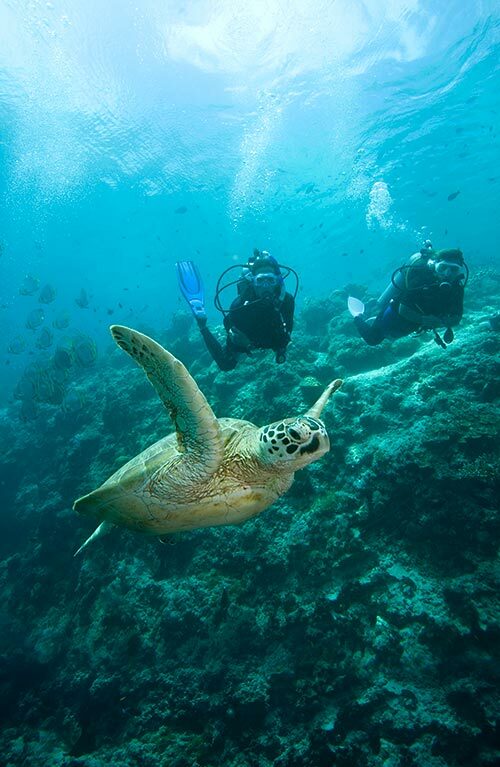 Beginners can take an introduction to SCUBA or full PADI Open Water Diver course – either way, they will be under the expert supervision of our divemasters and dive instructors at all times. Courses are taught with the latest PADI materials and available in several languages. Why would anyone want to scuba dive anywhere else but with Asia Divers PADI Career Development Center (CDC): the only PADI CDC in the Philippines? Asia Divers was established in 1987 and has since led the way in Puerto Galera and for many years in the Philippines. PADI (Professional Association of Diving Instructors) gave Asia Divers it’s very highest rating of CDC. As a CDC Asia Divers offer you the opportunity to make SCUBA diving a lifetime career. If you’re getting started with scuba diving or are looking to become a professional diver, we can get you off to the right start with Asia Divers professional instructors. What makes our dive instructors different? They care about you! The Asia Divers dive instructors have years of teaching and guiding experience in Puerto Galera and are always happy to attend to your every need. They know the dives sites inside and out and will make sure to give you the highest quality training available. If you have any questions about scuba diving as a beginner scuba diver or becoming a professional diver just ask one of the Asia Divers dive instructors at instructors@asiadivers.com. Are you ready to see some of the best sunsets in the World? Our Sunset Cruise departs El Galleon Beach Resort at around 4:30pm, with loads of beer and soft drinks. We’ll take a wonderful ride through the Puerto Galera harbor and follow the coastline to White Beach. Then, it’s pizza on the beach or maybe a beach BBQ? The El Galleon Sunset Cruise a wonderful way to meet people and enjoy the end of another beautiful day. A beach BBQ is a great way to spend a day with the family. Let us suggest a secluded beach for you and prepare a beach barbeque hamper from our kitchen. The contents of the beach barbeque hamper is up to you: beef, chicken or pork on a stick or a half chicken, prawns or fish, it’s really your choice, we can prepare any mouth watering BBQ you may desire. And if that’s simply too much to think about, ask our kitchen to put a selection together for you, you won’t be disappointed. You’ll find relics from the Spanish colonial era as well as some very interesting relics from a Chinese trader (1600’s or so) that struck a rock at the entrance of the Manila Channel, and then sunk. If you’re in Puerto Galera town it’s well worth stopping by. You can find the Puerto Galera museum inside the church grounds, close to the town pier. If you’re a diver ask about the remains of the Senior Christina Dela Vita on your trip to Verdi Island, one of our premier dive destinations. The Tukuran River tour takes you through some of the very best scenery Puerto Galera has to offer! The day starts off with a nice scenic jeepney ride along the Mindoro coastline in which you can stop to see the various view points. Then on to see Tamaraw falls, arriving just outside San Teodoro (about halfway to Calapan). From there it’s a quick drive to a hanging bridge where you can walk along to view the river below and perhaps even see a carabao or two. You’ll jump back on the jeepney to for a short drive to get to the start point for your hike along the river which you can follow for about 30 minutes on foot, or you can sit comfortably in the cart with the carabao pulling it. Our destination is a nice calm area with pools for swimming and good shade for lunch. There’s a lot of time to explore the area, take photos or just relax and enjoy a genuine tropical island paradise. After that, we hike back to our pick up point for the ride back to Sabang. The Mangyan people are the indigenous people of Mindoro. Take the Mangyan Village Tour and meet the Mangyan in their almost-original loincloth environment, we would be happy to organize it for you. 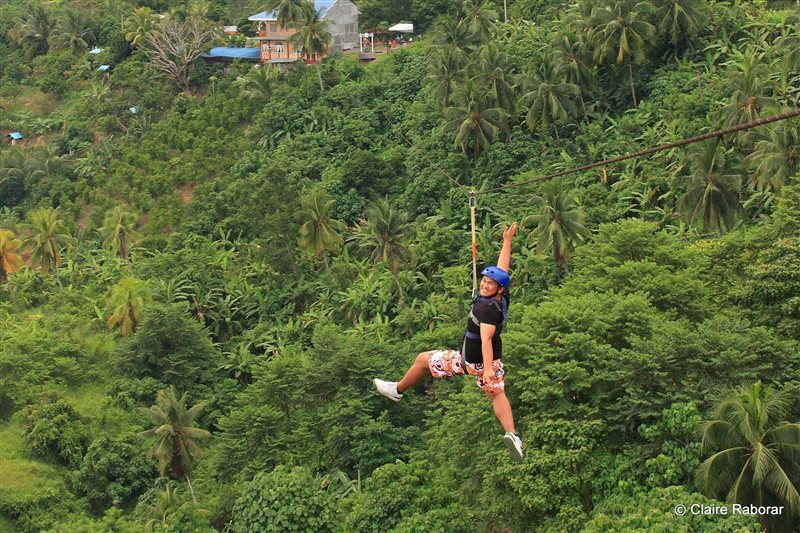 Enjoy the breathtaking views of the Puerto Galera peninsula all the way out to Verde Island and beyond, as well as the thrill of the adrenaline rush as you swoop down the zipline over the jungle canopy. Experience the thrill of riding a 610 meter zipline from Ponderosa to Green Mountain! Ponderosa Golf and Country Club is just an hour from El Galleon Beach Resort. Ask our front desk to book you in on a ride to the mountain area of Ponderosa – 450m. above sea level. The Golf Course consists of 9-holes that offer one of the most breath taking views anywhere in Puerto Galera. If you don’t play golf it is still worth the trip for the views over Puerto Galera Bay, the Verde Island Passage all the way to Batangas and Lubang Island. Cold drinks and food are available at the clubhouse. If you’re feeling fit and need to work off some of that extra energy we can suggest trail biking on mountain bikes. The island of Mindoro is very hilly and you need to know what you’re doing. There are places you can really test your ability and strength when trail biking around Puerto Galera. It’s a good way to see the area. Motor Biking: now we’re talking adventure! The island of Mindoro is very large and you can literally get lost on this big island. There are many trails you can take but be aware some of the local people find it hard to accept motorbikes being driven through their front land and it’s very hard to tell just where their front land is! So try and stay on the roads. There are plenty of dirt roads and we’re more than happy to draw maps and give suggestions on where to go. A day at Extreme Sports Philippines, guarantees a memorable and exciting day with family or friends. Visit the Adventure Park to experience outdoor Paintball, Go-karts, ATVs, Mud karts , Sticky wall , Zip-line, crossbow & airgun range and much more while you are in Puerto Galera. If it’s snorkeling you like, you have come to the right place! Puerto Galera’s crystal clear waters offer some of the best snorkeling due to the mangrove areas inside Puerto Galera bay itself. The coral life is one of the main reasons people come to Puerto Galera and you should not leave without seeing them first hand by snorkeling. The currents are one thing you do need to be aware of. Always ask an Instructor or Divemaster about how fast the currents are running, and where you should enter and exit the water when snorkeling. Don’t be put off snorkeling by these currents because there are long periods of the day when there is virtually no current at all. Ask our front desk for assistance when hiring snorkeling equipment. The Puerto Galera HHH gets together every Saturday afternoon at Captain Gregg’s bar along Sabang Beach. The HASH House Harriers (“HHH”) are a group of runners that like to drink and have fun. It’s a family affair, so they say! And it’s one hell of a way to see Puerto Galera. Some of the runs (or walks) take you to places that as a tourist you would never discover. There are 2 course available; one for runners, and one for walkers. So if you’re not up for a run you can walk a course that will be shorter than the runners’ course and end up at the “On” On”. The “On On” is a place such as a pub, a scenic clearing in a field,a beach or a hilltop. At the “On On” the Grand Master will call people that are on their first run (walk) to come forward and introduce themselves. Then you will be given an orientation to the HHH! The Puerto Galera Yacht Club (“PGYC”) is located in Muelle Bay, near Puerto Galera town. The Yacht Club offers a secluded and quiet place for people to eat, drink and meet new friends. Want to be alone or, have a few friends along on a quiet beach of your own? You can! Or, do you want to visit some of the other busier beaches around Puerto Galera? Whatever it is, we can arrange a beach hopping boat for you that will stay with you and bring you back to the resort whenever your beach hopping day is done. If a packed lunch or drinks are needed, we can do that too – for the best beach hopping experience! 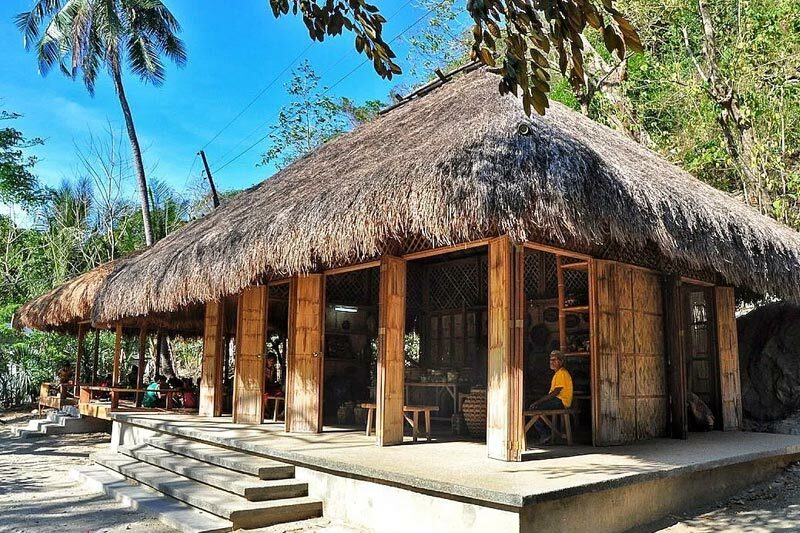 There are a number of good restaurants in Puerto Galera and Sabang. Please feel free to ask us for guidance when eating out. We will be happy to recommend some excellent restaurants: Thai, Italian, Korean, Swiss, Mexican and many more.